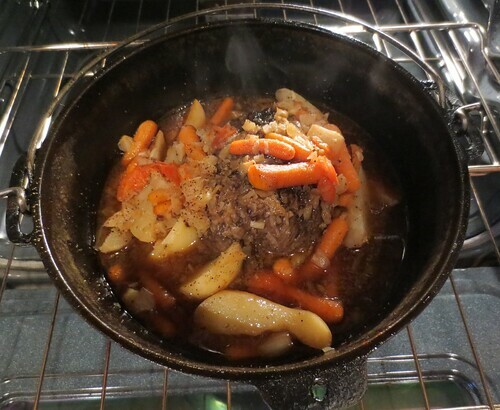 I love cooking in cast iron and thought baking my Elk roast in a Dutch Oven would be a good choice. Here are the following ingredients I used. Sprinkle the dry onion mix all over the roast. Then sprinkle the garlic and salt and pepper the entire roast. Combine the wine, broth, and Worcestershire sauce and pour it over the roast. I added some potatoes and carrots on the top of the roast to finish off the meal. Salt and pepper the veggies before putting it in the oven. Bake at 325 degrees in the oven for about 3 hours. Baste a few times over the course of the baking time. Conclusion: The Elk roast and veggies were outstanding. Wonderful flavor and such tasty tender meat!